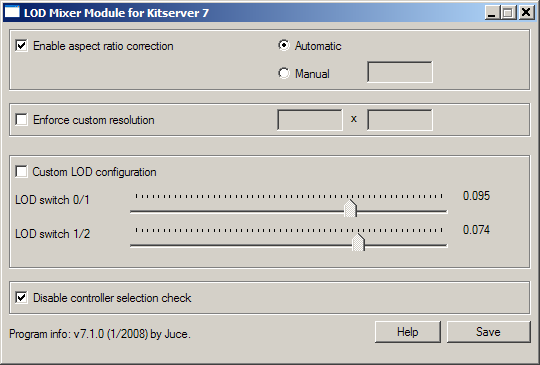 Kitserver 7 is an add-on program for Pro Evolution Soccer 2008. It is a loader and manager for various modules. Assign kits to all teams (no re-linking needed), Extra (3rd,4th,etc.) kits. Allows selection of kits in all game modes: Exhbition, Cup, League, Master League. Various tweaks to graphics and game options: Select quality levels which PES doesn't want you to choose; Any window resolution supported, hidden fullscreen resolutions unlocked; Manual/Automatic aspect ratio correction; Disable controller check for Master League/League/Cup games: this allows your friend to play for the opposition team. Assign special face/hair to any player you want. Assign unique boots to any player you want. Manage your "save"-data. Useful for patchmakers - to redirect all read/write operations from the standard "save" folder, to another one. Set the match time to any number of minutes you want between 1 and 255. 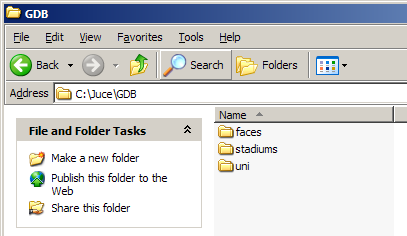 Organize your stadiums in the GDB. Organize your balls in the GDB. 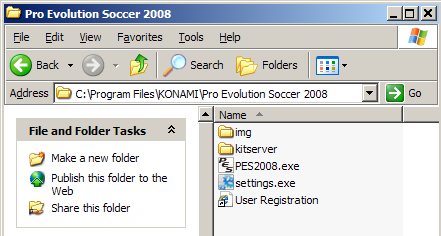 As with previous version of Kitserver, you have to unpack the archive to your PES installation folder. It should look like this: Then go to kitserver folder and run the setup.exe. What is new is that you can now also select your settings.exe. This is necessary because some changes are only possible in that file. simply select these both files (they should already be preselected) and click "Install". If you choose that you don't want to use Kitserver any longer, run setup.exe again and click "Remove". You can also install/remove Kitserver only for one exe by setting the other one to "no action". After installing Kitserver, if you run settings.exe from your game main folder, you are asked if you want to enable all quality levels. In PES2008, Konami doesn't allow you to choose a high quality level if the game thinks your PC isn't good enough for that. If you click on "Yes", that check is removed and you can try if they are right with their assumption. Apart from that you can now choose 4 controllers in the "Controller" tab. That means you can configure your gamepads here and later play with them. Note that by default the keyboard is controller #1. If you setup your gamepad as first controller, you can't play against someone using the keyboard and your gamepad. For that, you shouldn't setup a gamepad as first controller but always as #2, #3 or #4. However you can't use your gamepad in the main menu then, that works only with the first controller. In the kitserver folder, there is the program's main configuration file - config.txt. This is where you would need to make changes to enable/disable individual modules (DLLs), and/or configure module settings. Each module can have its own configuration section, which starts with [module-name], and typically has one or more options following it. Now, normally you wouldn't need to modify config.txt file, except for the cases, when you need to modify the behaviour of a particular module (DLL), or enable/disable such DLL. For example: rwdata module reads the "data.dir" setting from config.txt - check rwdata section for more details on this. The order of the DLLs is important. In particular: zlib1.dll, libpng13.dll must be loaded in that order before kserv.dll; also afsio.dll must be loaded before fserv.dll, bserv.dll, bootserv.dll, stadium.dll, and afs2fs.dll. Only in very rare situations you should try re-arranging the DLLs. GDB is a collection of different types of game data. In the current release, those include: kits, faces and hair files. In the future, there will also be stadiums and possibly boots. The GDB is essentially a simple hierarchy of folders: the root folder itself MUST be named GDB, inside it there is a folder for kits: uni, and a folder for faces and hair: faces. 1. The path MUST end with a backslash, like in the example above. 2. You specify the folder that holds the "GDB" folder in it, instead of the "GDB" folder itself. So, in the example above, the full path of the GDB folder would be c:\mypesfiles\GDB, but in the config.txt, the "GDB" ending must be omitted. Kserv module is responsible for serving kits from the GDB ("Game content DataBase") during the game. The main feature of it is that you are not limited to the slots that cv_0.img has for the kits, and you can assign a kit to any team. With Kserv and GDB, it is also possible for the teams to have more than 2 kits: so instead of just a standard pair of 1st and 2nd, you can have a potentially unlimited set of alternative uniforms for playing in European cups, or special exhibition games and so for. 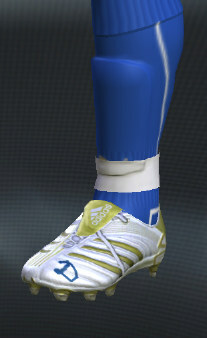 In real life, typically a team has a wide selection of kit variations. By organizing your kits in the GDB, it is possible to achieve that. You can see from map.txt above that in order to find a kit for team #69, the kitserver needs to go to the folder GDB\uni\EPL\Chelsea. This folder will contain all of the kits that are available to team #69. Inside it, you must create an individual folder for each kit. Like this: For players, 1st kit must have a folder name pa, 2nd - pb. Extra kits can have any folder names that start with letter "p". I found it useful to prefix all extra kits with px-. For example, px-blue. For the goalkeepers, 1st kit must be in the folder ga, 2nd - in the gb. Extra kits can have any folder names that start with letter "g". font.png Font texture: used for names on the back of the shirt 512x128 8-bit or 4-bit paletted image in PNG format. numbers-back.png Numbers texture: used for (big) numbers on the back of the shirt 512x256 8-bit or 4-bit paletted image in PNG format. numbers-front.png Numbers texture: used for smaller front numbers 256x128 8-bit or 4-bit paletted image in PNG format. numbers-shorts.png Numbers texture: used for numbers on shorts 256x128 8-bit or 4-bit paletted image in PNG format. This is the attribute configuration file. As before, it is just a plain text file - you can use Notepad or any other text editor to view or modify it. For each folder, you should have a config.txt file in it. description Any notes about the kit. This text will be displayed on kit selection screen, under the mini-kit. Useful when there are several similar kits that have near identical mini-kit rendering but you want to know which one is currently selected. any text in double quotes description = "All white (WC2006 Final)"
The colored rectangles indicate the "overall" colors of the shirts and shorts selected. This information is retrieved from main.color(radar.color) and shorts.color kit attributes in config.txt file - if the kit is from GDB; or from the game data, if the kit is from AFS (cv_0.img). If you don't define those attributes in your GDB kits, then you won't see the colored boxes. It is also possible to choose extra (3rd,4th,5th,etc.) kits in the Exhibition Mode. At the top of the screen, you will also see the Kit Selection Overlay - like in Cup modes. However, once the match starts, the kitsever will make sure the teams are wearing the kits chosen in Kit Selection Overlay at the top, and not necessarily the ones on the rotating player figures. In the future releases, i'll try to make it so that the rotating figures also change their kits dynamically, as you press the , , ,  keys. LOD-Mixer is the module that allows to fine-tune some aspects of PES2008 graphics engine. PES2008 offers only two choices for aspect ratio - 4:3 and 16:9. However, lots of LCD monitors don't exactly fit into either of those. Often, a 16:10 ratio is used, or even 16:9.6. This results in the picture being distored: players either too fat or too skinny, and ball is not round. You can set any screen resolution you want, if you play in a Windowed mode. Even crazy screens like 1567x532 will work, but you're likely to suffer from performance problems on such cases. Hidden fullscreen resolutions are fully unlocked now as well. However, only those that your video card really supports in full-screen mode, will work. If you accidently choose an unsupported fullscreen resolution, then PES should still be able to start in a window. For some inexplicable reason, PES series had always suffered from an overly- conservative LOD configuration, where the switch to low-poly models would happen way too soon, and that would result in various visible artifacts. In PES4-PES6, examples were: balding players, and missing details on kits. In PES2008, the players appear to have blurred generic faces, once they move slightly away from the camera. So, if you have a good PC and a fancy videocard with GPU cycles to spare, you may fancy tunning the LOD sligtly to make the game engine display more detailed models, even when they players are a bit away from the camera (Animation quality seems to be affected by this as well). To do that, move the sliders to the right. Also, if on the contrary, your machine is stuggling to run the game at a smooth frame rate, you can try tunning the LOD sliders in the opposite direction - thus making the engine switch to the low-poly models sooner than normal. This may improve the framerate, although at the expense of picture quality. To achieve that, move the sliders to the left. Note that in game versions 1.0 and 1.10, the second LOD slider had the default value of 0.070. In version 1.20, KONAMI had changed this value slightly and it is now 0.074, which makes the game switch from LOD1 to LOD2 a tiny bit sooner than before (if default LOD configuration is used that is). This feature may be useful to people who like to play a tournament - a league or cup together. 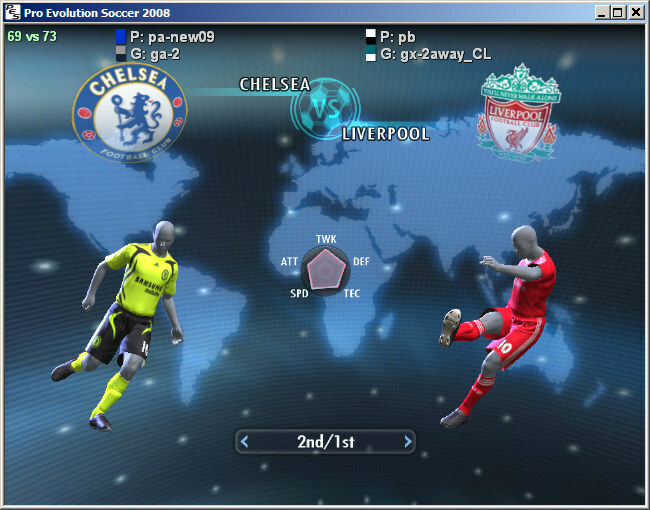 PES 2008 doesn't allow human players to control both teams, unless both of their selected teams are playing against each other in the match. With this new feature, you can remove that limitation. Now, even if it is for example, P1 vs. COM game, or P2 vs. COM - you can freely select which team you control with each controller. So, you can both play on the same team, or you can let your friend control the opposition - to make things more interesting. You can also now choose a "Spectator" mode for in tournaments. This is a relatively new kitserver module. It allows to organize your BIN-files into folders on disk, instead of inserting them into AFS(*.img) files, which is sometimes a pain, and may require a lot of extra disk space. In kitserver folder, there should be an img folder - if it's not there, create it, and then inside "img", create folders, as needed, named - cv_0.img, cv_1.img, rs_e.img, and so for. That's where you're going to be putting the BIN-files. Together with the afs2fs.dll, there's an example with cv_1.img folder, and a file called stadium_40.bin, which contains black nets (Euro2008 style), made by poloplo. That's one example of naming a file. By default, the AFS2FS module expects to find the img folder inside the kitserver folder. However, starting from version 7.2.3, it is now possible to configure the location of "img" folder to be anywhere on your hard disk. This makes it easier to both manage your game content - you can keep the "GDB" and "img" folders away from the game/kitserver folders, and also makes for an easier upgrade of kitserver. You need to specify the folder that contains "img", not the "img" folder itself. In other words, if the full pathname is c:\mypesfiles\img", then the option must be: img.dir = "c:\mypesfiles\"
The path MUST end with the backslash ("\") symbol, as in the example above. When replacing songs with AFS2FS, it is also possible to change the title of the song and the author name, by using a songs.txt map-file, which should be put into kitserver\names folder. Faceserver makes it possible to load as many faces and hair from the GDB as you want. So, you can assign each player a unique face/hair combination, if you want to, including custom created players. 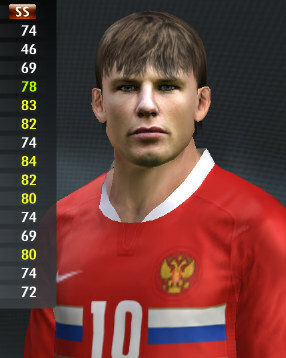 Faceserver makes use of unique ids, which are assigned to each player, and it creates "virtual" face and hair slots, that only exist during run-time. One difference from how faceserver worked in the past is this: new faceserver works ok in replays. If you have faceserver enabled (which it is by default), just start the game, and then in the kitserver folder, there should appear a text file called playerlist.txt. It will contain the IDs for all the players that you have in your game, sorted alphabetically for easy searching. Bootserver makes it possible to assign each player a unique pair of boots. Like faceserver, the bootserver makes use of unique ids, which are assigned to each player, and it creates "virtual" boot slots, that only exist during run-time. If you have bootserver enabled (which it is by default), just start the game, and then in the kitserver folder, there should appear a text file called playerlist.txt. It will contain the IDs for all the players that you have in your game, sorted alphabetically for easy searching. The filenames are relative to GDB/boots folder, but inside that you're free to organize them whichever way you want: either one flat directory, or a folder hierarchy. The only important thing is that you correctly specify the paths in the map.txt. The double-quotes around filenames are optional. This feature is useful, when you have a large collection of boots, but you only care about a handful of important players to wear the "right" boots. So you map those in the map.txt, but for the rest of the players you don't want to go through the tedious mapping process. What you can do, is enable "random-boots" mode. In that case, all the players will get GDB boots assigned to them when PES2008 starts: the ones mapped in map.txt will get theirs, but other players will be assigned boots randomly from the entire GDB boots collection. Note, that the random assignment is only done once. So a player will wear the same boots, until your exit the game. When you start again, the same player will probably have different boots. It would be nice to have the players change boots each match, but as of now, this is NOT implemented, because of instability it brings to the game. You may want to exclude a certain set of boots from the random distribution: maybe those are "special" personalized boots that only the star players are supposed to wear, or something like that. It is now possible with the latest version of the bootserver. This will "hide" all boots and subfolders of GDB\boots\Special from the process of random boots distribution. This module allows to organize a Konami Cup, which is more like the real UEFA Champions League: you play 6 matches in the group, then 2 in each of the knock-out rounds, except the final, where there's only 1 match. Press [F2] to switch between the default mode (3 games in group, 1 in each knock-out round) and the new mode (6 games in group, 2 in each knock-out round before final, 1 game in final). Once you have played your first group match, the number of matches in the group becomes fixed, and you won't be able to change it anymore - the "G" will become grey. Similarly, once you played the first match of the knock-out stage, you won't be able to change the knock-out settings anymore as they become fixed. IMPORTANT: THE PRINCIPLES AND FUNCTIONALITY OF THIS MODULE HAVE CHANGED. If you used earlier version, please read carefully about the changes in behaviour. This little module allows you to redirect the reading and writing operations for all types of data from the standard KONAMI folder (My Documents/KONAMI/Pro Evolution Soccer 2008/save) to another folder. This module was originally intended for patchmakers that use kitserver as their base, because then Edit Data, System data, replays, and all others can be included in the patch, and kitserver can make the game work with that folder, while keeping the original folder unmodified. This can also be useful for easy switches between patches and simple uninstall operations. One important limitation: the data folder MUST be located in My Documents/KONAMI/Pro Evolution Soccer 2008 folder - in other words, alongside the original "save" folder. If you install somebody's patch that is using rwdata module, and suddenly it looks like all your cups, leagues, master league saves, and replays have dissappeared, don't get alarmed. Your files are probably safe in the game's original save folder, so when you uninstall the patch, you'll see them again. (Or, if you want, you can simply copy them over to the new data folder, which is used by the patch). This tiny module allows to stretch the length of the match to normal 90 minutes, if you want, or even beyond that: making the seconds flow slower than normal. Also, another extreme is setting the match time to 1 minute. This is a whole new experience too: you have to really treasure the ball - keep posession, or you risk not getting it back at all, before the final whistle! Also, if you get a scoring chance, better put it away, because chances are it'll be the only one you get. 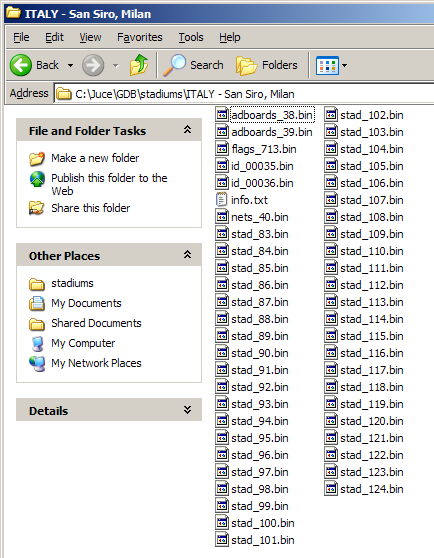 Stadium folders are all together in one directory - there is no hierarchy possible, but by having the stadiums named systematically, you can make it easy to quickly find the stadium you want. The first way is probably simpler, and more convenient, because stadium makers can distribute their stadiums the same way as they been doing so far: just naming the files like unnamed_213.bin or dekuip_381.bin. Also, in this form, stadium can be used both with AFS2FS module (or inserted directly into the cv_1.img file, using traditional tools like AFS Explorer or DKZ Studio), and also with the stadium server, without any need to rename the files. The second way to name the stadium files relies on a set of predefined - "reserved" names. (I kept this feature for backwards compatibility - in case some stadium makers use those names. But, in my opinion, it's more practical to use the AFS2FS naming conventions - as in first way, described above). You select the stadium before the match, using the same screen as you would do the kit selection. The trick is to switch to the stadium selection page first, by using [PgUp] or [PgDn] keys. (Most of the time, there will only be 3 pages available: kit selection, stadium selection, and ball selection. The only exception is the Cup mode, when you had chosen "Group League" format - in that case there will be additional 4th page - to tweak the competition format. - reset stadium back to "game choice"
The last two keys are useful for quick browsing through big collection of stadiums, if you had organized them well. For example, if you prefix all stadium folder names with the country name, then it's easy to quickly skip over all the stadiums from the same country, using either [-] or [=] keys. One other file, which you can place in every stadium folder - is a text file, called info.txt. There you can define one of these 3 properties: name, built, and capacity. The "name" property is really optional. It is used, when the cut-scene at the beginning of the match shows the stadium name, or in the Exhibition mode, when the stadium selection screen comes up (after you had already chosen your stadium from GDB, on the stadium selection page). If you don't define "name" property, then the stadium folder will be used as the name. You select the ball before the match, using the same screen as you would do the kit selection. The trick is to switch to the ball selection page first, by using [PgUp] or [PgDn] keys. (Most of the time, there will only be 3 pages available: kit selection, stadium selection, and ball selection. The only exception is the Cup mode, when you had chosen "Group League" format - in that case there will be additional 4th page - to tweak the competition format. - reset ball back to "game choice"
The last two keys are useful for quick browsing through big collection of balls: youo can quickly skip through all the balls starting with the same letter, using either [-] or [=] keys. If you have a large collection of balls, and you don't want to manually select the ball before each match, you can enable the "auto-random" selection mode. It works like this: if a team has a home ball assigned to it, then that ball will be selected; but if not, then a random ball will be selected automatically - so you don't need to go to ball selection page and press  - it will be done by ballserver.